On January 10 1987, Madonna’s Papa Don’t Preach was honoured as America’s Most Popular Video and the World’s Favourite Video at the 1st annual World Music Video Awards, produced by Canada’s MuchMusic and Europe’s Sky Channel. Jay’s Note: Oops! I posted for the wrong day yesterday. This one is appearing twice, sorry about that! 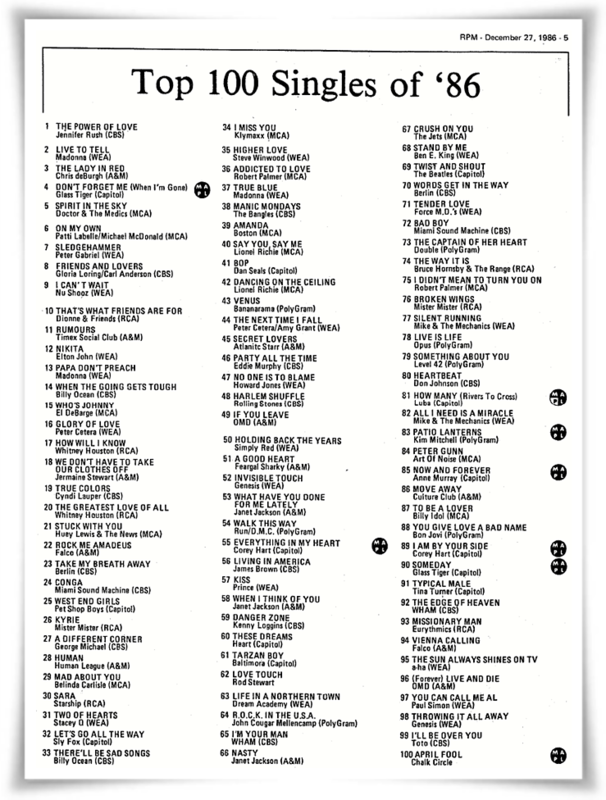 On December 27 1986, RPM magazine published their list of the top charting singles of 1986 in Canada. A stark departure from her earlier pop hits, Live To Tell was initially considered by her record label to be a risky choice for a single. Its success showed that programmers were willing to give Madonna some room to grow on radio. On September 4 1987, Madonna performed Causing A Commotion live via satellite from the Stadio Communale in Turin, Italy, during the Who’s That Girl World Tour and won Best Female Video for Papa Don’t Preach at the 4th annual MTV Video Music Awards at the Universal Amphitheatre in Los Angeles, California. 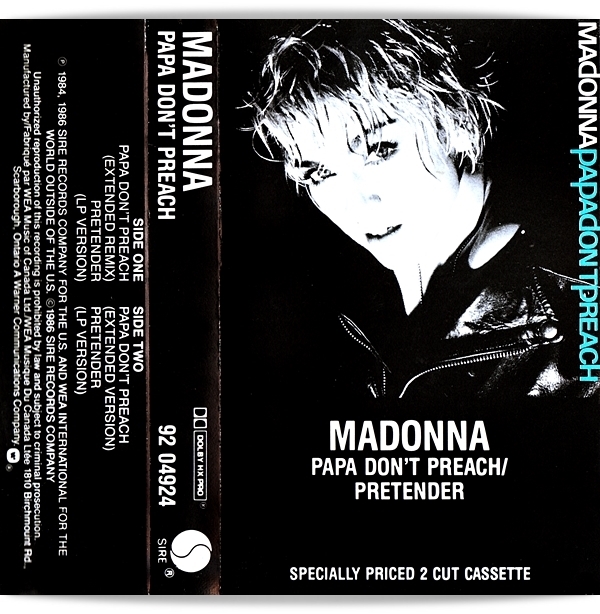 On August 23 1986, Papa Don’t Preach spent the first of two weeks at #1 on Billboard’s Hot Maxi-Singles Sales chart. 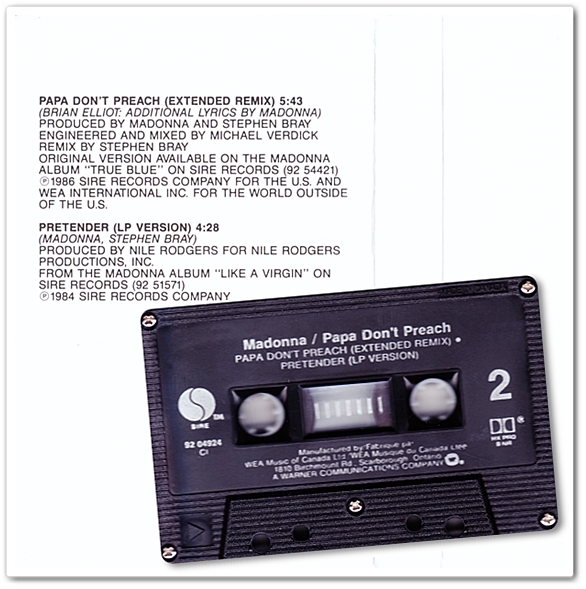 Despite being more of a pop/rock song than a club-oriented cut – both in its original form and in Stephen Bray’s extended remix version – Papa Don’t Preach nevertheless managed to reach #4 on Billboard’s August 30th Hot Dance/Club Play chart due to the massive buzz surrounding the song and its undeniable crossover appeal. On July 18 2004, Madonna played the first of three sold-out dates at Toronto’s Air Canada Centre during her Re-Invention Tour. Playing to a combined total of over 52,000 fans, the shows were the only Canadian stop on the tour and marked her first concerts in Canada in eleven years. At the second show Madonna proclaimed to those in attendance that they were the best audience of the tour thus far, while the final Toronto date saw Madonna in an uncharacteristically playful mood. Interrupting the show’s normally swift progression between Papa Don’t Preach and Crazy For You, she joked about the infamous 1990 threats of arrest and whipped the audience into a cheering frenzy with her self-described “unprofessional” behaviour. On July 12 1986, Madonna’s Papa Don’t Preach reached #1 in the UK and stayed there for 3 weeks. 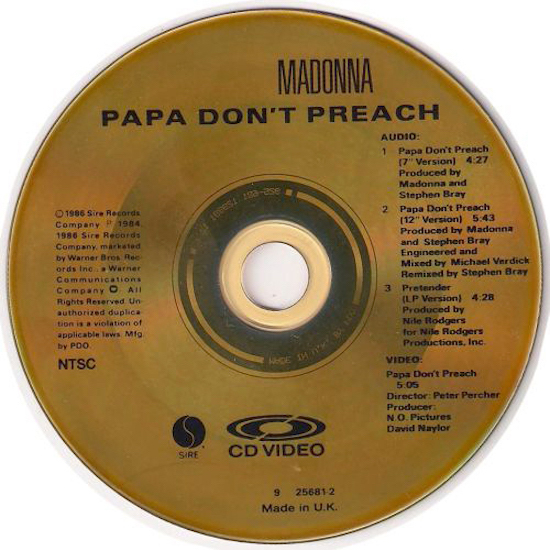 Madonna’s first-ever CD single was for Papa Don’t Preach. The single was produced in the UK for distribution in the USA. 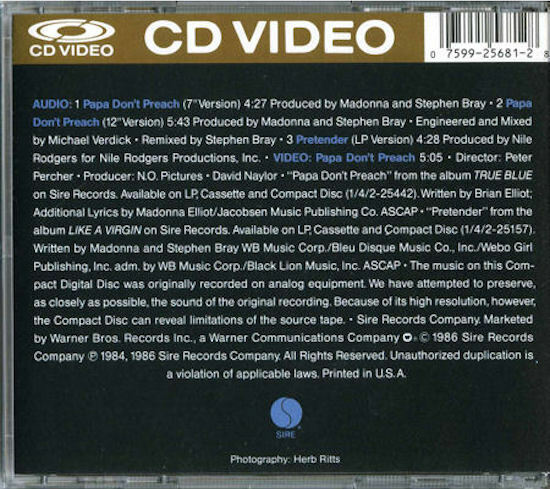 The rare gold disc CD single featured 3 audio tracks as well as the official video for Papa Don’t Preach in NTSC format.